All my nieces and nephews get quilts. Eventually. Sometimes their mothers need to help by learning to piece the tops, but they all get quilts. Mason has been very patient. All the feathers were machine free-motion quilted. I attempted to add to my feather repertoire . It was a great project for experimentation. Mason’s name is quilted in one of the patches. He’s pointing to it below. As I said, Mason has been very patient. He gave me a big hug and a heartfelt “thank-you” which is what every quilter wants to receive when gifting a quilt. I’m just glad I got it finished before he graduated from high school. Get my blog delivered to you via email every time I write one, or read them online. 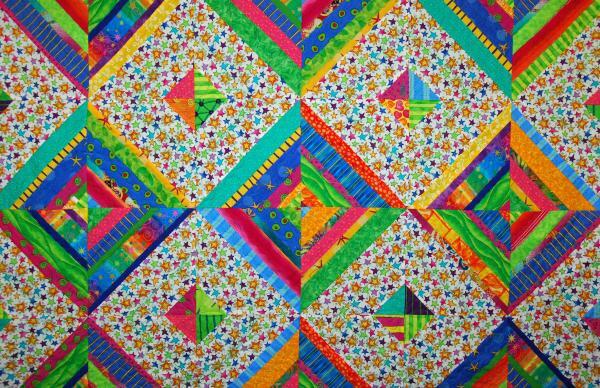 Join my community of quilters on Facebook. I have quilted a couple of quilts with a fleece backing for a customer. You’re right ! The quilting shows up lovely. The difficulty with fleece is if the quilt is large, you have to piece the fleece. And because of the stretch, it’s really tough to piece evenly. Half of my customer’s backing was tight, the other half saggy!! Let’s just say that it got “quilted” out, and she loved it! Ami: I do not pre-wash my fabric. 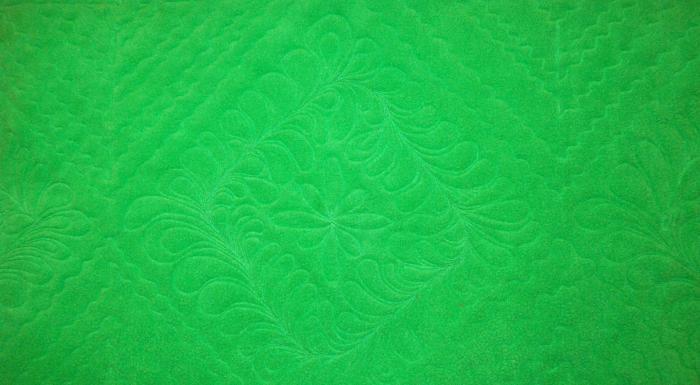 Can I still use fleece for backing a child’s quilt? I don’t think one has anything to do with another. Just know that fabric shrinks at different rates, no matter what it is. 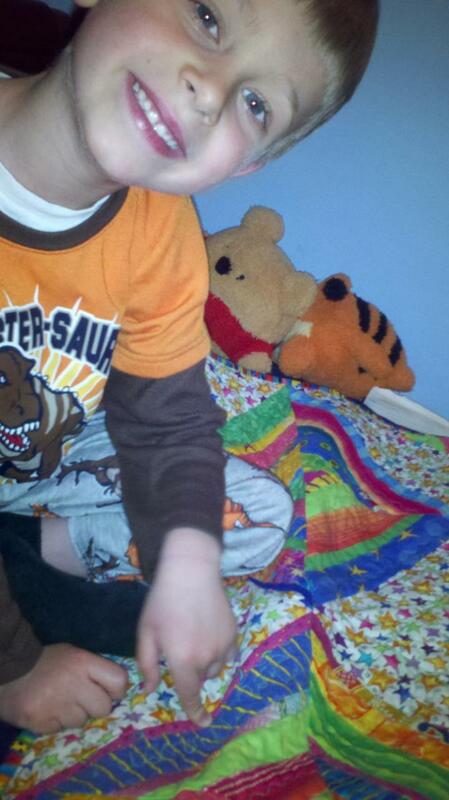 Your nephew Mason is one handsome and lucky little guy. I know he will enjoy his quilt. Great job Aunt Ami. Your ‘feather repertoire’ is looking really good! I always love to see your accomplishments! Lucky Mason! Happy Mason! I’ve been using fleece for the back of kid’s quilts every since I read it on your website a few years ago. It makes the quilts super soft and cuddly. Never thought of using fleece in place of the batting and the backing. And I have never seen/heard of this anywhere else. I’m surprised that the quilting is so easy. I would think that there would be a lot of shifting and stretching. Gotta try it. I’ve only done it on small quilts, and I always baste before quilting, no matter what. Mason looks like one happy boy! Love that smile! The quilting is beautiful! LOVE the colors in Mason’s quilt! What a cheerful quilt and your strings continue to rule! Nice work on the quilting. Ami: What weight Fleece do you use–100/200/400? Then no backing is added? No idea. I didn’t know fleece cane in different weights! The fleece ISt he backing. Also sometimes called lining. I really like the quilt Ami. I didn’t realize that you can use fleece instead of the batting and the backing. Will you tell me more about how you baste your quilt? Do you do the spray baste? Or hand baste? Wow! I just found your blog and will be following for sure! I’m just beginning to try experimenting with different techniques in quilting and will enjoy trying this one out! The quilt turned out really lovely and is a good idea for a quilt that is definetly a boy quilt.